Church design build -also known as “design-construct” or “single responsibility”, is a system of contracting in which one entity manages both the architecture, engineering and construction under one contract. In the church design-build system, the architect and construction contractor work together as a team. The traditional process to building can often leave you to make important decisions on your own. You are responsible for finding an architect to design your project and then finding a contractor to build it once it has been designed. It is then your job to ensure that they communicate and work together within your budget and vision. Many times you will not discover what your design is going to cost until much too late in the process. Church Design-Build is different – it’s a one-stop-shop for all your design and construction needs. Many times a budget is established at the beginning of the design; and then you, the architect and the builder work together as a team to design towards your budget. What distinguishes the church design-build process is the source of responsibility, combining both architect and builder into one entity. This allows the church builder to assign actual numbers to the drawings throughout the design process and provides the owner with a more accurate “picture” of realistic project costs. 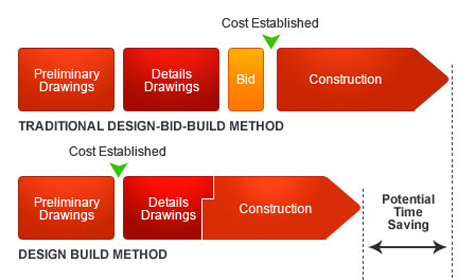 One option for a design-build system is to identify a company that offers both architectural and construction services. Another option is to find a company which is willing to work with another company to provide the design-build concept. Regardless, design-build is a very attractive option for the owner as it allows the team to value-engineer the project throughout the design phase. This ultimately saves the owner both time and money. In addition to all of the benefits of the church design-build system, it is important to mention one possible weakness. In the design-build system, no third-party is involved to act as the balancing agent. This, however, can be easily remedied. Many churches will use a staff member who understands the construction process to act as a third-part representative, but this is not always necessary. If the owner is careful to choose trusted well qualified companies, a third-party may not be needed. Regardless, it is vital to choose trusted team players who have your best interests at heart. This will greatly enhance your project, and ultimately, make the part you play in the project a much more rewarding one.